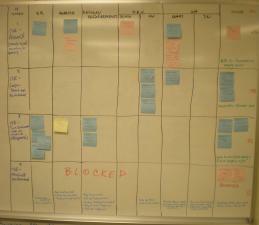 In No More Iterations I showed our 1st attempt at a kanban board. Now that we have a little more experience I'd like to show you where we are now and where we stopped on the way. Here is where we started. 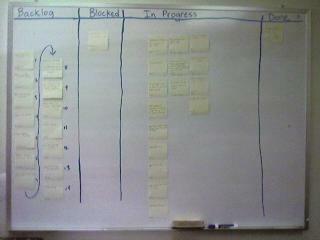 Columns for backlog, blocked, in progress and done. Notice the large number of items "in-progress" even though there are only 7 people on the team (can you say multi-tasking?). In fact this was pointing to the fact that developers were building stuff faster than QA could consume it. One bottleneck identified. Here is the same board a few weeks later. Note the new column for blocked work in process (WIP) and that the number of in process stories has been reduced significantly. The number of completed stories increased dramatically. An interesting side effect was that developers were not used to having "idle" time and this was very disconcerting for many weeks. It seemed like they were waiting for the other shoe to drop - i.e. some manager was going to come in and yell at them for not working as hard as possible. 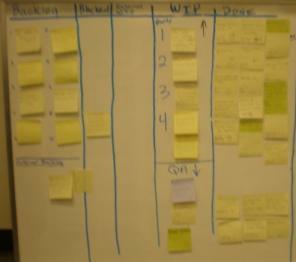 This is a task board the team put together to identify the tasks required to complete the stories in the WIP. The idea here was to let other people know what was remaining to be done so that team members could help each other out or at least not step all over each other. Here is the next evolution of the task board. The WIP stories are listed down the first column and the various internal states are the remainder of the columns. 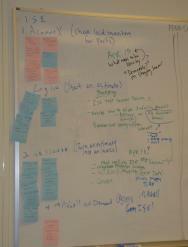 The sticky notes are the actual tasks that need to get done (color is meaningless). Here is a combination story task board from a different team. They chose to run the stories across the top row with spots for Backlog, WIP, Blocked and Done. The WIP stories get moved down to head the row just like the other team did. For this team they did use color and sticky dots to indicate various items, but honestly I've forgotten what them meant. So where are we now? Interestingly things have been going smoothly for awhile so I had to wander over into the team spaces to be sure I remembered correctly. If you've followed along above you may have noticed that the boards got more complicated as we went. Since then we've been simplifying. Also we've gotten used to working this way and it turns out that if you work on a limited number of things, minimize multitasking and talk to each other there isn't much need to use up a big whiteboard with sticky notes. 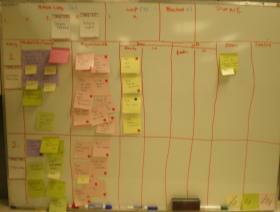 That's right - we no longer have a kanban board. Now that isn't to say we've abandoned the concepts, we've just determined that we don't need the big visible board. Currently tasks are being tracked in Extreme Planner and stories are being tracked in a spreadsheet by the project manager. I use a parallel spreadsheet without all the gory details to help the stakeholder prioritized work, see what is in process and what various releases might look like. In a way I schedule the entire department on a single 8.5 x 11 piece of paper that has its roots in our very first kanban board. This entry was posted by wayne and is filed under Agile.